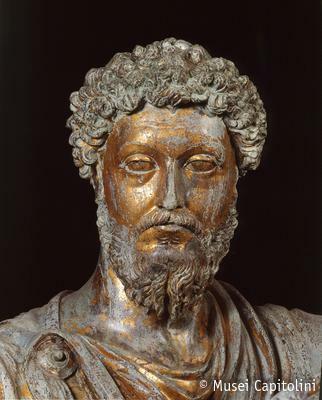 This statue represents the Emperor Marcus Aurelius . 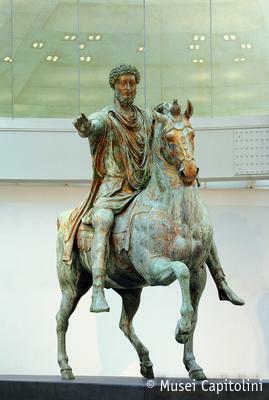 The figure of the emperor is dressed in military clothing (for example the tunic and cloak), but his feet are shod in civilian shoes, of the type worn by patricians and senators. Scholars believe that originally the statue included a defeated enemy placed under the foreleg of the horse. The emperor himself held an unknown object in his left hand, while he stretched out the right as if to address a crowd. . The statue is made of two separate pieces, the emperor and the horse. It is the only equestrian statue to survive antiquity until the present time. Its preservation is attributed to a mistaken identification of the Emperor as Constantine, who legalized Christianity in the Roman Emperor and thus was looked upon kindly by the early Church. Normally, bronze statues would be melted down so the metal could be re-used. The original location of the statue is unknown. The first records of the statue are medieval and describe it as located outside the Lateran Palace. In 1538 it was transferred to Piazza Campidoglio through the orders of Pope Paul III Farnese (1534-1549). The statue was placed in the center of the Piazza according to Michelangelo’s famous redesign of the Capitoline Hill. The Emperor and his horse remained at the center of the piazza for centuries, the fulcrum of the entire space. In 1981, for reasons of preservation, the statue had to be removed from its base and moved inside the Palazzo dei Conservatori. A copy was made and erected in the place of the original statue. The statue dates to the period following the Germanic Campaigns (169-175 A.D.) and was most likely erected in time for the subsequent triumph of 176 A.D.